Today is the age of the food blogger. Sit down in a restaurant for twenty minutes and you're bound to see someone taking photos of their freshly prepared fare, whether they're a blogging pro with 20k followers or an occassional Instagrammer with a private profile. Why do we do it? 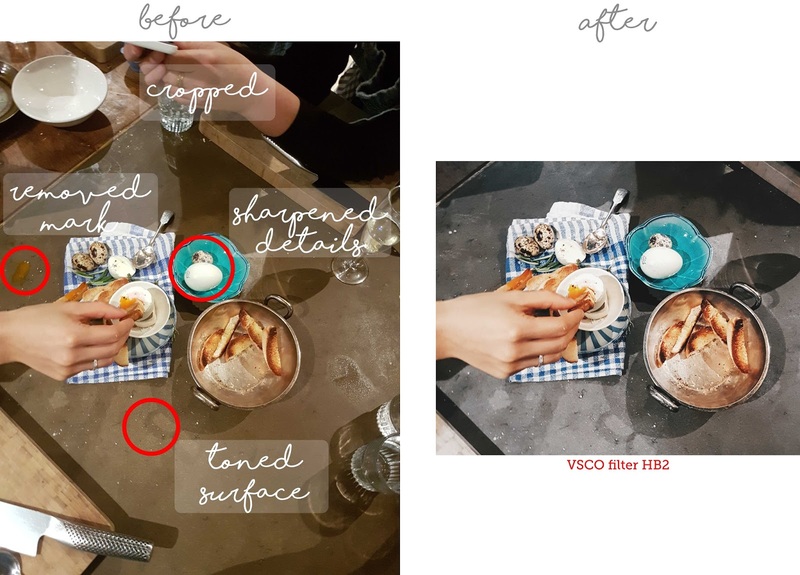 Because food is the new fashion, with plenty of eateries making their dishes look Instagram-ready so that you - prior to devouring - can upload it to social to brag to your friends and, in turn, provide the restaurant or café with free marketing. Yup, everyone's at it, from New York-based Cha Cha Matcha's millennial pink and green interiors to Starbucks' name fails - make your food (or drink) go viral and customers will fall over themselves to eat it. 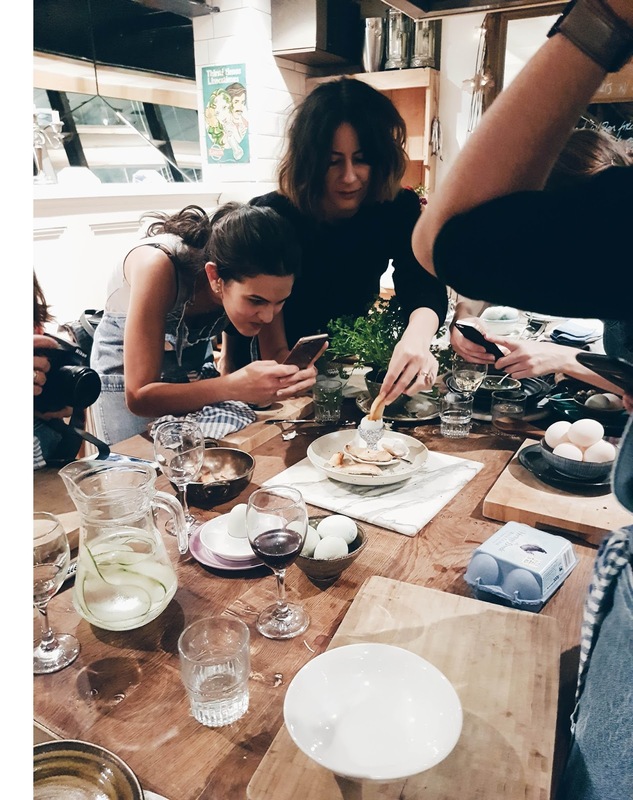 But because everyone has a cameraphone these days, and they're all taking photos of their food, how do you, as a food blogger, make your content stand out? 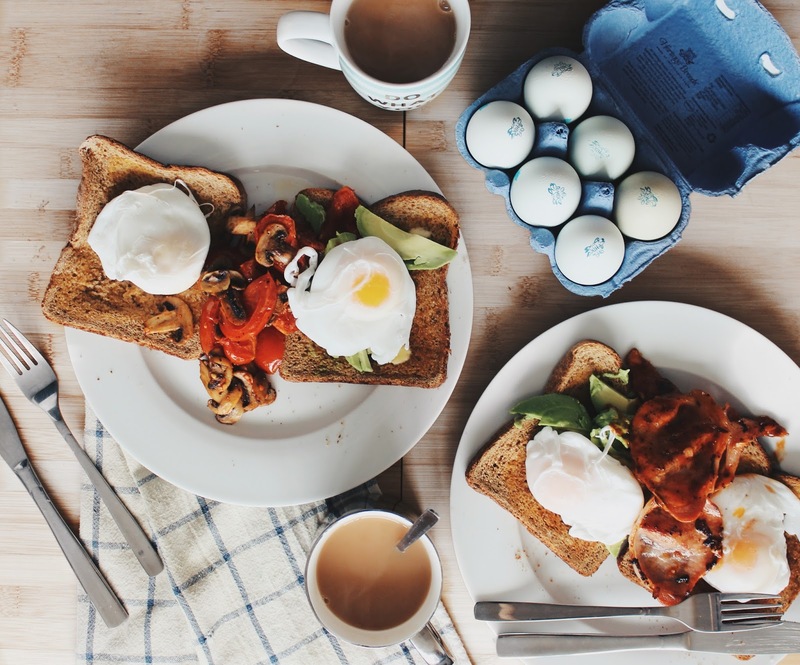 Well, for every 100 blurry iPhone shots taken with flash lighting (bleurgh), there's one thoughtfully planned out image which makes you want to turn on the stove and rustle up something equally delicious (or step out to your nearest Café Rouge). In that image, you'll usually find natural lighting, interesting composition and a pleasing filter - as well as the most important part: a tasty dish. 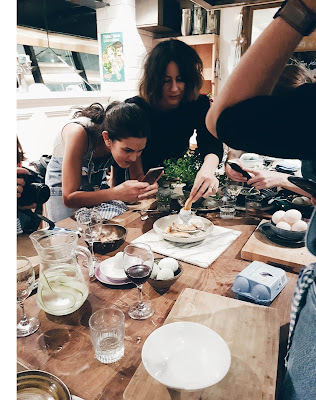 I chatted with chef and author Anna Barnett (right, creating the perfect dippy egg at a workshop at Food at 52 with Heritage Breeds), whose moody food photos have attracted over 19.5k followers on Instagram. Anna's theme consists of mostly neutral tones with a pop of colour, like a bright orange egg yolk or a juicy green pear. Her shots of the food she cooks are often taken from above, but she juxtaposes these with pictures of architecture, interiors and even her very fashionable outfits. The main thing I noticed about Anna's Instagram account is that she's always playing with texture - a raw, wooden table here, a marble mosaic tray there - making every shot interesting for the viewer. In this post, I'm going to go through three photography elements that Anna, and many other food bloggers, consider when they're taking their food shots. Remember these each time you take a photo of your food, and they'll hopefully help you put the 'hot' back into 'photography'. Before you position your dish, take a moment to think about the composition of your photo. Where are you going to take the shot? Will it be on a table, a tray, or even a richly coloured ottoman with a blanket loosely draped over half of it? Decide whether you want your background to play a large part in the image or whether you want your food to do all the talking. Popular backgrounds for food photography include marble and wood, but you might want to try something different, like polished concrete or glass bricks. Once you've established your background, think about props. Ask yourself, 'What would make this photo that little bit more interesting?' Maybe it's a pretty blue saucer that you found at a vintage market, or gold cutlery that you picked up from Zara Home. As Anna told me, however, try not to add in things that you wouldn't actually use while you're eating your food - it'll just look strange. Instead, try candles, bouquets of flowers or cookery books. Position them so that they're slightly out of the frame - too many props lining up with each other or with the edge of the frame can look forced. Once you've got your props, position your dish. It's a good idea to do this last, so that you can eat it right after you've taken the photo without having to worry about my previous two points. Straight off the bat, Anna told me that good natural lighting is key. Why? Because it shows off the subject how it was meant to be seen - not with dodgy blue/yellow/red tones. Also, natural lighting will usually cover all areas of the photo, allowing you to achieve even tones throughout. You might think that taking your shot outside is the logical answer, however, too much natural light can be a bad thing - especially if it's really sunny, as it can cause high levels of contrast or wash the details out of your image. Instead, take your photo near a large window, so that the light is filtered and not too strong. If you can't use natural lighting because it's late in the day (or you've decided to have a midnight snack), use white or slightly yellow lighting to achieve a similar effect to natural light. Beware of shadows, though. Even pros edit their photos. You might think it's a bad thing to edit, or use a filter, but it's not. As long as you're not distorting the photo so far that you might as well have stolen an image right off Google, editing is the best way to put the final touches on your image. If you're a rookie, start off with filters. If you haven't used them before, these are presets which allow you to add a 'look' to your image without fiddling around with details. Good apps for filters are VSCO, Snapseed and Enlight. If you want to get a little bit more advanced, try using apps like Facetune or Filterstorm Neue. And there's always Photoshop if you can afford the software. I shot this using a Canon 600D, then used a curves layer in Photoshop to dull the highlights and lift the shadows slightly. After that, I imported it into Facetune on my phone. I cropped the image, then used the Whiten tool to remove the yellow tones from the surface. I then used the Patch tool to remove the crumbs, before importing it into VSCO to apply the A6 filter to about +10.9. I shot the above image on a Samsung Galaxy S7 and imported it straight into Facetune. I cropped the image to get rid of extra hands, glasses and kitchen tools, then toned the surface using the Whiten tool. I used the Patch tool to get rid of a mark on the table, then used the Details tool to sharpen the details on these wonderful Heritage Breeds speckled quail eggs. After that I imported the image into VSCO and applied the HB2 filter at full level. How do you edit your photos? Let me know in the comments section below. For bread bakery logo designs, we observe that brown and green are Baked comfort food colors for bread shop emblems. The images that have been used are crafty and attractive that is related to the product.